Bag Valve Masks & Portable Oxygen Units: Emergency oxygen and ventilation supplies should always be part of your first aid and safety program. 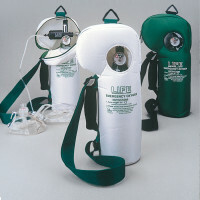 Our Life OxygenPac and Life OxygenSoftPac oxygen systems provide supplemental oxygen for both breathing victims (as an inhalator) or as a CPR resuscitator adjunct for a non-breathing victim. These come in adjustable flow supply (6 & 12 LPM) or fixed flow (6 LPM). 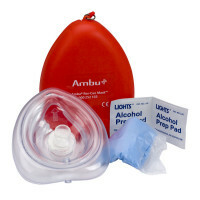 Our Ambu Spur BVM's (Bag-Valve-Mask) units are also an important part of a safety program for use in manual ventilation on victims that are non-breathing or are not breathing adequately. These BVM's are designed for Infants to Adults. Always be prepared! Life OxygenPac & SoftPac fixed or adjustable flow, Ambu Res-cue pocket mask, BVM and more. Looking for LIFE? We carry portable oxygen tanks like life oxygen pac and life o2 softpac, leaders in the medical oxygen tank arena and makers of oxygen supplies. 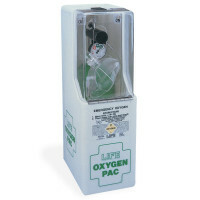 If you need medical oxygen supplies, home oxygen supplies, a CPR oxygen tank or CPR oxygen bottle, or are looking for first aid oxygen kits, first aid oxygen tank or first aid oxygen cylinder, our first aid oxygen bottles and first aid oxygen equipment are the type of first aid oxygen systems you need for your emergency oxygen kit. When comparing emergency oxygen tanks and emergency oxygen systems, consider more than the emergency oxygen mask - the emergency oxygen supply in your portable emergency oxygen, is critical - as emergency oxygen cylinder comes with most emergency oxygen units, and is the source of the oxygen supply. As an oxygen supplier, we offer first aid oxygen equipment, home oxygen equipment, home oxygen supplies, portable oxygen equipment, medical oxygen equipment, and other oxygen products. Unlike most oxygen equipment suppliers, we carry at home oxygen supplies, portable home oxygen supplies, medical oxygen tanks, and medical oxygen cylinders with built in medical oxygen regulators. Whatever your emergency oxygen needs, turn to us - Safety Supplies & Savings online Since 1993.